In the wee hours of this morning, Georgia Secretary of State Brian Kemp all but claimed victory in his battle against attorney and voting rights advocate Stacey Abrams for the governor’s mansion. The “math is on our side,” he told his supporters. But Abrams, who could become the first black woman governor in the United States, was having none of it. Election Day in Georgia began exactly the way Abrams’ supporters had feared. Hours-long lines formed at majority-black polling places across Metro Atlanta; in some, elections officials had deployed fewer machines than they had available, claiming—despite obvious indications to the contrary—that they hadn’t expected high turnout in the historic showdown between Abrams and voting-rights foe Kemp, who, having refused to step down from his secretary of state post, is overseeing his own election contest. At Anderson Livsey Elementary School, a polling place in Snellville, one frustrated voter filmed the interminable wait; officials said the voting machines had no power cords. “This is voter suppression,” the amateur videographer commented bitterly. New machines were eventually added in some precincts—in one case, at the demand of the Rev. Jesse Jackson, who showed up to persuade folks to stay and exercise their franchise. But by early afternoon, according to Sara Henderson of Common Cause Georgia, the average wait time at Atlanta polling places was still about three hours. Once most of the polls closed at 7 p.m.—a few were kept open longer after civil-rights groups brought their complaints to court—the early returns seemed to indicate that Kemp’s voter-suppression crusade had paid off. But as the night wore on, and results trickled in from Atlanta, the margin dwindled. 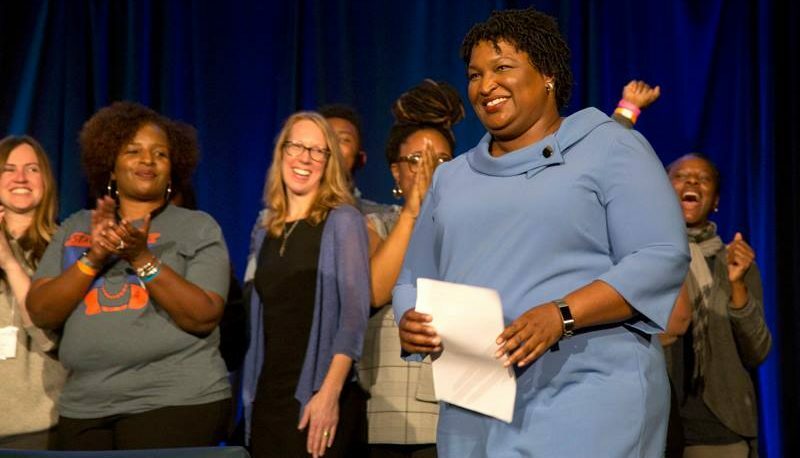 And just before 2 a.m., in a downtown ballroom still packed with hopeful Democrats, Abrams came out to tell them she wasn’t giving up any more easily than the folks who’d spent half the day waiting to exercise their franchise. Although news outlets were calling the race for Kemp, the projected margin was so narrow that the final tally could yield a less definitive result. “Democracy only works when we work for it, when we fight for it, when we demand it,” she declared, “and apparently today when we stand in line for hours to meet it at the ballot box. I am here to tell you there are votes remaining to be counted. Voices are waiting to be heard.” Accordingly, she vowed not to concede the race until “every vote is counted.” At that point, tens of thousands of absentee and provisional ballots—mostly from the Atlanta area—had yet to be tallied. Enough, potentially, to drop Kemp’s percentage of the vote below 50 percent and force an automatic runoff election in December. It could be early next week until they’re all counted. By Wednesday afternoon, the prospect of a runoff looked even better than it had at 2 a.m., with Kemp’s percentage at just 50.3. If Abrams does gain enough votes to earn a runoff, what happened in Georgia may go down as one of the most stirring victories for voting rights in American history, even if she doesn’t win the final tally. The problems at the polls on Tuesday were only the latest in Kemp’s long crusade as Georgia’s chief voting official to prevent the state’s rising majority of black, Latino, Asian and young voters from breaking the GOP’s 20-year hold on power. As I reported for Right Wing Watch last month, Kemp has used his office since 2010 to unleash the most aggressive campaign of voter suppression since the days of Jim Crow. Using the infamously faulty Exact Match system, he’s purged hundreds of thousands of registered voters, mostly black, from the rolls on specious, sometimes illegal, technicalities. He has waged a campaign of intimidation—sometimes at gunpoint—against voting rights groups and individuals trying to register their fellow Georgians. He’s encouraged local officials to close more than 200 polling places in predominantly poor and black communities. And on his watch, the state has rejected more mail-in ballots, again using technicalities, than almost any other. In her quest to become Georgia’s first African American governor, Abrams—who’s fought Kemp’s voter suppression every step of the way—had to overcome a more intangible obstacle: Voters and potential voters who had a hard time believing that those in power would ever let a black candidate win in Georgia. But with the help of an army of voting-rights and civil-rights groups, who’d been working on the ground in the state for a year—and longer—her aspirational campaign overcame the understandable cynicism, along with the tangible roadblocks to getting folks registered and making their votes count. Even without all the votes yet tallied, turnout in Georgia this year shattered all midterm records, reaching presidential-level numbers. Whether or not Abrams prevails in the end, this hard-fought effort to overcome Kemp’s “Jim Crow 2.0” methods (as Emory professor Carol Anderson, author of One Person, No Vote, describes them) will be a model for progressives to follow in other states where Republicans continue working to tamp down non-white votes. Voting-rights groups challenged Kemp in court at every turn, and didn’t stop when judges ruled against them. Working with Abrams and Georgia Democrats, they registered hundreds of thousands of new voters, and helped others regain the franchise taken away from them. Perhaps most importantly, Abrams’ campaign urged voters to cast absentee ballots—which create a paper trail that Georgia’s ancient voting machines don’t allow—sending out hundreds of thousands of ballot-request forms to Democratic voters well in advance. Abrams also encouraged folks to make use of early voting, just in case Election Day turned out to be as discouraging as it did; to drive home that point, she voted early herself. As Anderson wrote at The Atlantic today, “Abrams didn’t have to fight just an electoral campaign; she had to fight a civil-rights campaign against the forces of voter suppression.” And when it was all over—but not over yet—Abrams made sure that none of the folks who’d had to fight for their right to vote would end up discouraged. Her fighting spirit on Wednesday morning sent a message, loud and clear, that the battle would ultimately end in victory—if not in December, then soon. “Tonight,” she told her cheering supporters, “we have closed the gap between yesterday and tomorrow.” And everybody listening knew, against all odds, that she was speaking the gospel truth.